In Mannar, Sri Lanka, June 16, 2011, was a special day for two Salvatorians. Damien Peries, SDS, andTheeban Juliu, SDS, both deacons, were ordained to the priesthood at St. Sebastian's Cathedral. 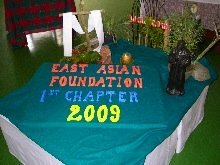 On the following Sunday, June 19, in their home village of Vankalai, a few miles away, they concelebrated their first Mass at St. Ann's Church. And what a celebration it was. Very early in the morning, before the heat of the day could mount, nearly the entire village gathered in the square in front of the church which was decorated with huge posters and covered with flowers. 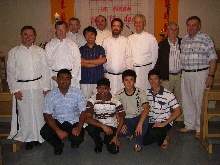 Musicians and dancers enhanced the occasion, and Salvatorian priests from India, Sri Lanka, and the Philippines, joined the two new Fathers in the Mass. "Go, the Mass is ended," said Fr. Damian, "but the festivities have just begun." Food, under preparation for days, with special Sri Lankan touches, began to appear, and did not disappear until late in the evening. Fathers Damian and Theeban, have now begun their pastoral ministry, joining Fr. 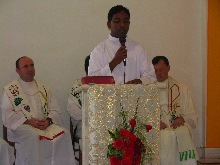 Prabu, SDS, ordained last year, Indian Fr. 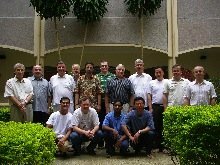 Philip, SDS, superior, and scholastics, Brothers Nirmal and Vinothan, SDS, who make up the growing Sri Lankan vicariate.